/ Our Team / Marc E Hoffman, DO, F.A.C.S. Meet Marc E Hoffman, DO, F.A.C.S. Dr. Marc Hoffman's area of expertise is in disorders of the retina, vitreous, and macula. 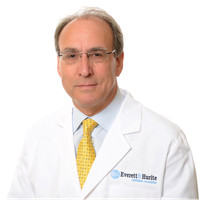 Since joining the staff of Everett & Hurite in 1983, he has been actively involved in the management of the spectrum of retinal problems: diabetic retinopathy, age-related macular degeneration, retinopathy of prematurity, proliferative vitreoretinopathy, and others. Dr. Hoffman has published in such professional journals as Retina, the American Journal of Ophthalmology, and Ophthalmology. He has also participated in studies sponsored by the National Eye Institute. He is a certified retinal surgeon for the National Retinopathy of Prematurity Cryotherapy Study, which determined the stardard treatment criteria for retinopathy of prematurity, greatly reducing the incidence of blindness in some high-risk premature babies.